It was a tough last game for the Hampton Rovers Women’s side against second placed side Beaumaris Sharks who were in great form in their lead-up to the finals, in a twilight match at Banksia Reserve. The Sharks got the jump on the Rovers in the first quarter. With clean clearances from the centre making life hard for the Rovers back 6 and finishing the quarter with 5 goals to nil. The second quarter was a much improved performance, with the Rovers midfield and backs stepping up to repel numerous Shark attacks inside 50. Chloe Mirams was marking everything, Lucy Timmons managing to perfectly torp the ball outside the defensive 50 on kick-outs and Carla Hewitt playing an important loose in defence. The Sharks ended the quarter with just 2 goals scored. At half time co-captain Bianca Lenarcic brought the girls together and asked for a rallying last half of the season effort from each and every player and the team responded, keeping Beaumaris to just 1 goal for the quarter. The mids were working more efficiently, taking advantage of the good ruckwork from Bianca Lenarcic, Tash Harrison and Jess Yates. The McLaren sisters tackled ferociously all and Sheedi Ferrari-Brown and Vic Cleary worked tirelessly up and down the wing. The game opened up in the last quarter and there were some great forward line efforts from both Lizzie Dingeldei and Tarryn Hurst dodging through opponents and booting the ball forward. It was the most attacking quarter for the Rovers, unfortunately they just couldn’t finish their opportunities and finished with 2 behinds. While disappointed with the result, the Rovers Women’s team should be incredible proud of their efforts this year playing in the third highest VAFA Women’s division. The improvement through the year is a testament to the hard work and commitment of every player. They are building an amazing culture and attitude as the pioneers of Women’s football at the Rovers which will be enjoyed by many players for years to come. 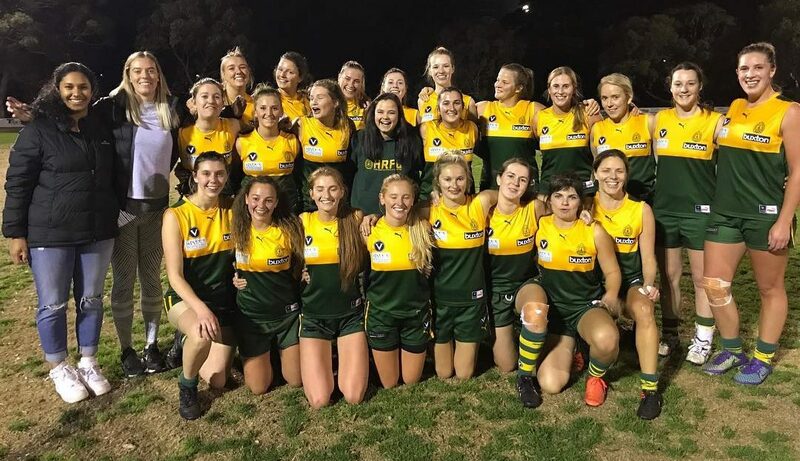 The future is bright for Women’s Footy at the Rovers with three junior girls teams this year, including the Under 18’s who have qualified for the SMJFL Finals and will look forward to stepping up to Senior Footy at the Rovers in 2019.